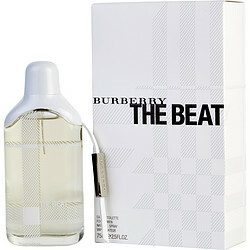 The Beat by Burberry is an expression of upbeat, youthful energy that any woman will welcome into her beauty routine. Introduced in 2008, it sparkles with bergamot and mandarin and settles into summer florals, soft musk, and warm cedar for femininity that's irresistible. Pink pepper adds a delicious kick to this bright daytime fragrance, uplifting your mood with its spicy profile. Turn the mundane into something more exciting with this enthusiastic fragrance, which will serve you well for work, luncheons, and other everyday affairs.